Most people's first thoughts of Hong Kong are a buzzing, hectic metropolis, with its skyline dominated by towering skyscrapers. Yet just a stone's throw from the concrete maze, lies many natural treasures hidden in the city. Such examples include the Outlying Islands, each a short ferry ride from Central. 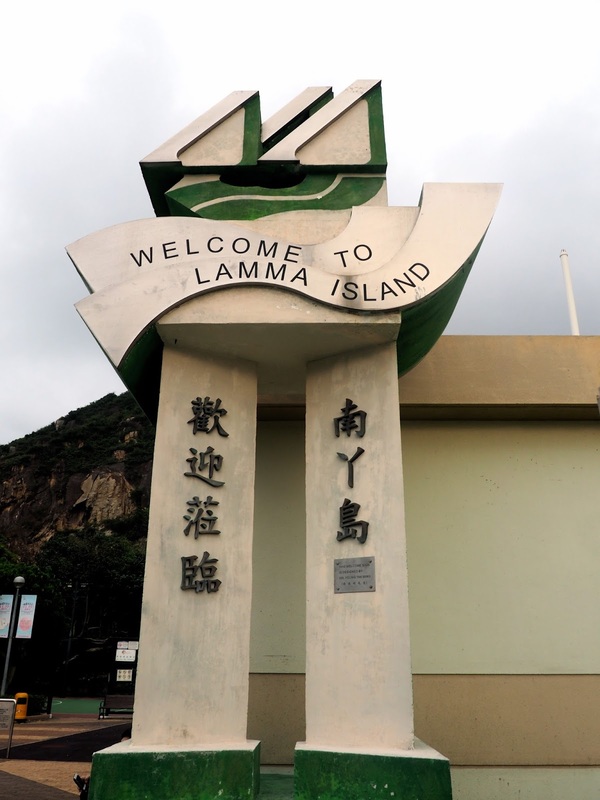 I visited my first of them on my recent day off this week, Lamma Island. The ferry leaves from Central pier four, and takes a brief 20 minutes to Yung Shue Wan, or 35 minutes to the smaller village of Sok Kwu Wan. We started our day at the former, the largest town on the island (though still very small!). The ferry ride was pretty smooth, since we weren't far out to sea, and it was a calm day, and it was also pretty quiet, as it wasn't a weekend or public holiday. It was actually Dr Sun's Birthday, which hasn't been a public holiday here since Hong Kong was handed back to China by the British, but my school still gives us the day off. Yung Shue Wan is a rather nice town, and my flatmate and I commented that it felt as if we were on holiday! Sunshine and seaside on an island away from the city? Lovely! The harbour by the town was filled with all these little boats, giving it an old-fashioned, rustic sort of feel, which continued as we ambled along the main street. It's a little bit ramshackle, in the best way, and the island has no cars, making it feel like a far cry from the modernity of the city. Though there are little truck things driving up and down the narrow streets, which got annoying pretty fast! The town is also full of quirky little shops and cafés, and I could have bought so many nice things, if I had anywhere to keep them here! 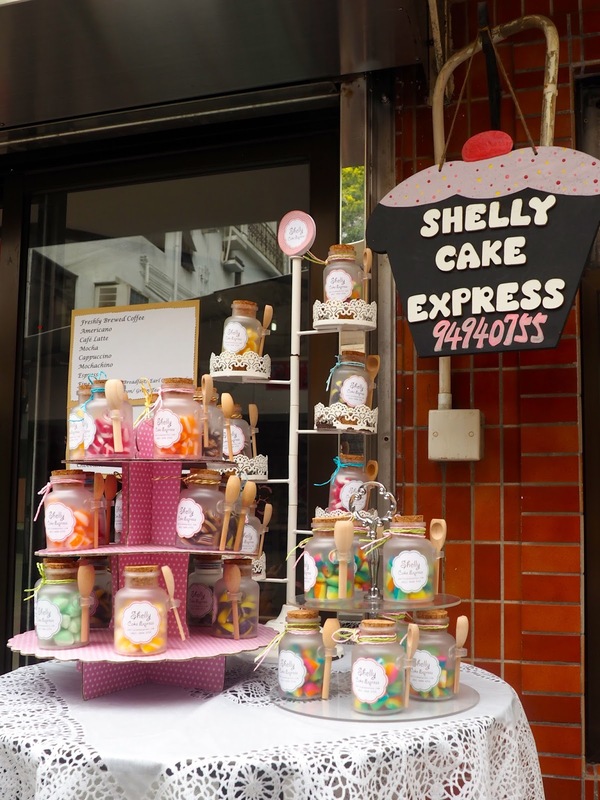 We even got ice creams to really make it feel like a holiday! We wandered as far as Tin Hau temple, just one of many dedicated to the goddess of the sea all across Hong Kong, and is fitting to have on an island. It certainly wasn't the most spectacular we've seen, but still had the bright colours and incense spirals found in most temples. 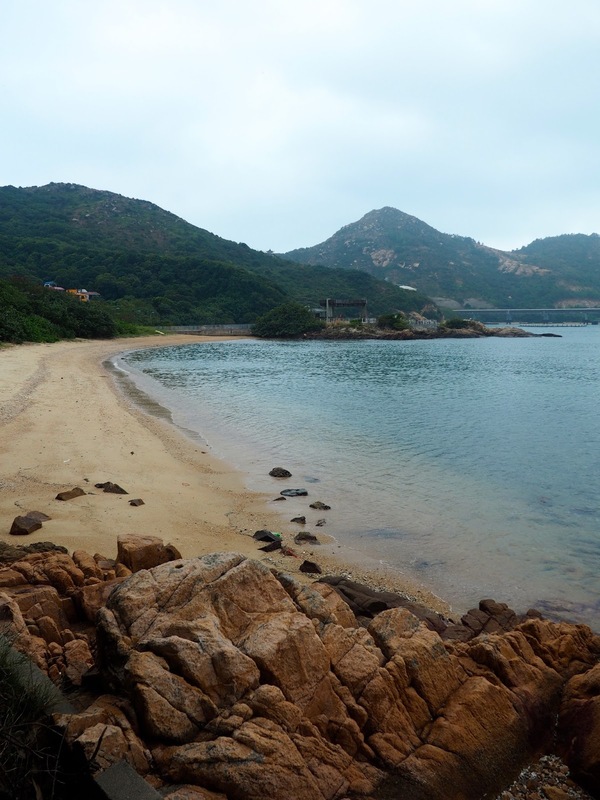 From Yung Shue Wan, it was a short 15 minute or so walk to Hung Shing Yeh Beach, and is easy to find by following the signs along the way. 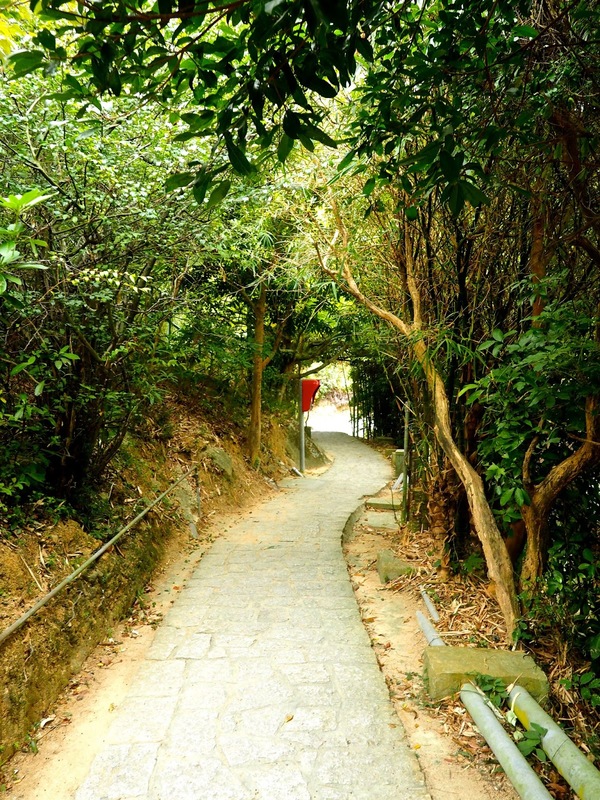 The walk itself passes through shady greenery, and is very peaceful and easy. The beach itself was lovely - until you walk far enough along it to turn back and see the massive power station behind it. This was an ongoing annoyance as our walk continued later in the day, since it sort of spoils what is otherwise quite an idyllic place. However, there are still plenty of nice things about the island, and as you can see, I got plenty of pretty pictures that don't include it. The sun began to get lost during our time on the beach, and it was a bit cool for swimming or bikini sun-bathing (not that that stopped some others around), so we opted for a brief wander to get some photos, then paddling in the shallows - though we did both manage to get our trousers wet doing that! Then we flopped on the sand for an hour or so, just to relax, since it was still pretty warm, and very peaceful there. Eventually, we hauled ourselves up and continued along the Family Trail, as it is called, heading south towards Sok Kwu Wan. The trail is fairly easy, but fair warning, there were some steeper inclines that I had realised there would be! The cloud cover was also increasing, which wasn't ideal, but did make the temperature more tolerable for hiking. The hills were worth climbing though, from the views from the top. The lookout pavilion is the highest point, and it's definitely worth walking around in front of it, off the main path and on to the dirt tracks, where you'll get the least obstructed views. 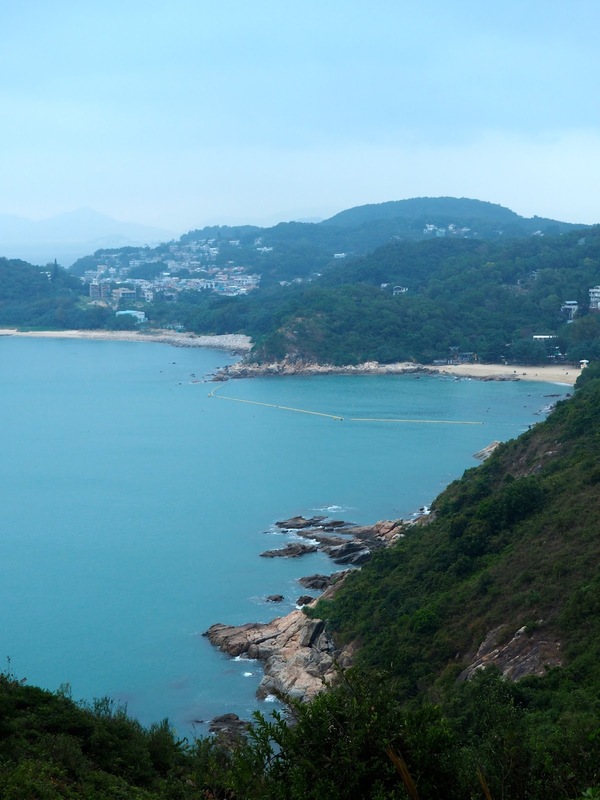 Again, the power station is a rather unsightly blemish on the horizon, but there are some lovely scenes of Hung Shing Yeh Beach beside it, and the open water and winding coastline in the opposite direction. From there, the hike descends towards Sok Kwu Wan, and sadly also gets slightly less picturesque, as there was more rubbish strewn about, especially near any buildings we passed. It took a little under an hour to reach Sok Kwu Wan after leaving the beach, and I had mixed feelings about it. It didn't help that it was getting darker, I was tired, and the weather had taken a very dreary turn, but I wasn't as enamoured with this town as I was by Yung Shue Wan. The view of the waterfront and these quaint little fishing boats makes it look quite pretty, but the town felt very rundown and empty, and a bit of a disappointment. There were some lovely views back towards Hong Kong Island though, from the path just beyond the pier, and although we didn't stop for any, there are plenty of seafood restaurants to choose from. The ferries from this harbour are less regular, so we caught the next one back, rather than wait two hours for another. Although I have no great fondness for that particular town, there is a whole other part of the island to the south of it, on a circular hike, including the Fisherfolk village and another beach, which we had neither the time nor energy to explore that day. We will be back for another trip to see it though! Wonderful. Just as I remember it. Thank you.